The wonderful Underland to Wonderland created such a fun tag based around Harry Potter, and after seeing it circulating I was super excited to give it a go! The jist of this is to imagine being part of this world and how your life would be! Basically what I think about everyday because let's be real, Harry Potter is life. 1. Are you a Pure-Blood, Half-Blood, or Muggle-Born? I would say Half-Blood. I'd like to think I have an ounce of Magic in me, don't I? Don't I?! 2. Which wand chose you? 3. Did you take an owl, cat, rat or toad with you? Definitely an owl. I love the idea of such a loyal companion as well as trusted creature who can send and deliver things for me. A snowy owl for sure! 4. Where did the Sorting Hat put you? 5. What House did you want to be in? I think I was lucky to be sorted in my favourite House. I definitely have respect for all the other houses, but there's something about belonging in Gryffindor that just proves how brave and courageous you are. Or at least I try to be. 6. Which lessons are your favourite and least favourite? This is a hard one! Would definitely be a toss up between Transfiguration and Charms because that's pretty much what I thought Magic would be like. Least favourite would most likely be History of Magic just because of how Professor Binn supposedly teaches the class, or probably Divination. I don't have a favourite animal per se, but rabbits or guinea pigs are the cutest! A butterfly would be nice as well. Imagine the Dementors being distracted by them fluttering through the air. Ooo. 8. When confronted with a Boggart, what does it look like to you? Cockroach. I have a huge phobia of cockroaches and I would have no clue how to riddikulus it away. 9. Do you partake in any school sports or magical hobbies? In high school I participated in pretty much every single school sport, so Quidditch is something I would interested in. Otherwise, definitely some type of book club! 10. If you have free time, where would you be found hanging out? Soo many places to discover but for sure Hogsmeade or Diagon Alley when possible. Still, I'm such a home body so the Common Room would be the best place to lounge with my friends. 11. You are most likely to get detention for what? Talking back to the teacher, because that's actually what I would get detentions for. Occasional duels maybe? Or wondering off school grounds. Oops. 12. What career do you want after leaving Hogwarts? As any aspiring witch or wizard, being an Auror would be amazing, but something fun like coaching a Quidditch team or being a professor at Hogwarts. Because Hogwarts really is home. Have a go at this Tag if you want to, I found it really fun! Leave a link down below for me to take a read as well, I've been reading everyone else's and they're all so unique! How Will Your Life Be At Hogwarts? Okay this is such a cool tag I adore it! I loved reading your answers. 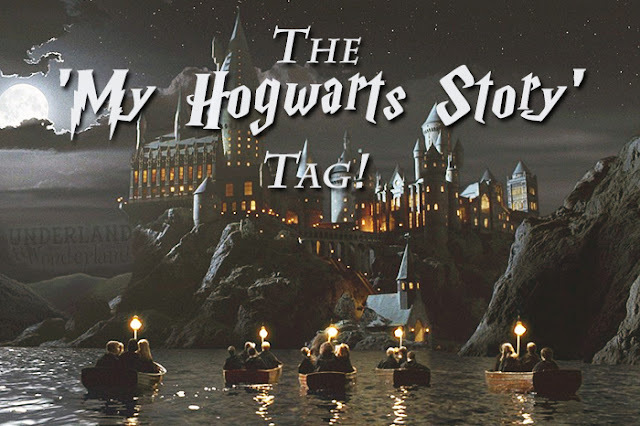 I think I may have to borrow this tag for my own blog, haha, it looks like such great fun!